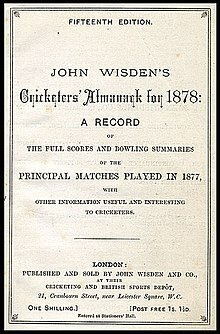 ↑ Wisden Cricketers' Almanack, 1966 edition, pp vi–vii. ↑ Awarded to a Pakistani player but not listed as a result of alleged match-fixing. "If [the player in question] were exonerated, then it would be possible to reconsider the position," explained [Scyld] Berry. "That's why I didn't pick anyone else instead. But as things stand, we don't feel we can choose him. It's all very sad."